The 2016 MLB Draft is just three days away, with the first round set for June 9th. With the Draft nearly here, it's time to take a look at how the first round could shake out. Need at the major league level doesn't usually play a major a role in what MLB teams do, unlike in the NFL Draft. Because draft picks often don't reach the majors fora few seasons, teams tend to take the best player on their board. That's especially true for the mid-to-late first round picks. With that in mind, here's our shot at projecting the first round of the MLB first-year player draft. The Phillies will likely take Puk or high school outfielder Mickey Moniak. While the pick isn't set in stone, Puk appears to be the favorite. A lefty with a fastball that can reach the mid-to-upper 90s. He'll be a Top 2 pick unless a medical issue pops up in the final few days before the draft. Senzel appears to the be the favorite for the Reds' pick, unless Puk is on the board. Outside of Senzel, outfielder Kyle Lewis is also a potential option. The 20-year-old Senzel has one of the best bats in the draft this year. 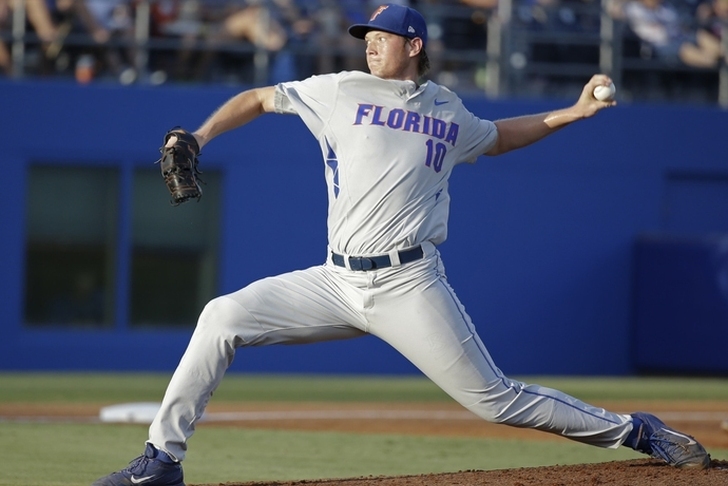 The Braves have historically preferred high school arms, and Groome is a good one. Also in the mix is Lewis and high school pitcher Riley Pint. Groome was the early favorite to be the No. 1 pick, but has struggled a bit this season. Still, the potential is there. The Rockies reportedly love Moniak, although he could go higher than this. If Moniak is off the board, Lewis could be the pick. Moniak could be a long-term centerfield for the Rockies. The Brewers are likely to take a raw, toolsy player. Pint fits that mold, as do OF Corey Ray and SS Delvin Perez. Pint is quite the flamethrower, and can hit the upper 90s. All indications point to the A's wanting Lewis, Groome, Moniak or Senzel. Only Lewis is left and the A's would prefer a college bat anyway. The Marlins surprised most "experts" last year and could do so again this year. But they've been linked to Garrett and that pick makes sense. He has one of the higher floors of the prep pitchers this year. Quantrill hasn't pitched in over a year because of Tommy John surgery, but the Padres are still high on him. The son of former MLB pitcher Paul Quantrill, Cal looked sharp in his only season at Stanford. He's viewed as a riser and the Padres will likely have to take him here since he won't fall to their No. 24 pick. They might have a pre-draft deal with Quantrill as well. The Tigers like college arms and Hudson is clearly the second-best in this year's class. If Pint somehow falls this far, he's likely the pick. Don't rule out high schooler Matt Manning here either. This would work out pretty well for the White Sox. Ray could go higher than this, making it a steal. The White Sox want a college bat, and it just so happens Ray is from Chicago. The Mariners will likely take a college player, making Dunn an option. He's been linked heavily to the Mariners in recent weeks. There isn't any real consensus on what Boston will do. Dunn makes sense since he's local, but he's off the board. We'll go with Perez, who might not last this long. This is a value pick for Boston. Rutherford and Tampa is a popular mock selection. Rutherford is already 19 years old, but has a surprisingly advanced bat. Unless someone surprisingly slips, Rutherford should be pick. The Indians don't mind taking the risky prep pitcher and that could be the case again this year with Anderson. It might be tough to sign him, but there's less risk with Anderson than Matt Manning (more on him later). The Twins need pitching help from the majors to the minors, and Whitley will help provide that. The Angels new regime won't fear drafting high school players. The Angels need players that can help now, but most reports link them to high schools bats. The Astros have a limited pool to sign players, which helps the idea they're going to pick a college player. Burdi is one the most major league-ready players this year, as he could help out as a bullpen arm this summer. This might end up being too low for Collins, but he fits New York's apparent desire to add a college bat. He needs work as a defensive catcher, but the bat is there. The Mets have been so heavily linked to Craig this almost too obvious a pick. Craig might not be able to third long term and a switch to first base is an option. But the bat is there and that's what the Mets want. The Dodgers have been linked a college arm and a high school bat with their two first rounders, so it would work out great if Jones was still here. He could go at least five picks higher than this. The Blue Jays historically like prep arms, making Muller a fit here. Given that Toronto traded away a few pitchers last year, it makes even more sense for the team to take a pitcher. The Pirates taking the local product in Zeuch just makes perfect sense, if he lasts this long. This is actually the last of the true first rounders in the 2016 first-year draft. Manning is a Top 10 talent, but high contract demands will likely cause him to drop. The Cardinals aren't afraid of taking prep pitchers, although they'd need to save money with their other picks to afford the reported $4-5 million price tag. This is the first of 11 compensation picks that are considered first rounders this year. Lowe could go much higher than this, although the early 20s seems like his proper range. Adding a college arm and then a prep hitter makes sense. Another value selection for the Padres. Thaiss could go as early to the Mets at No. 19. Adding a college arm is the likely option, but if Lux is on the board he should be the pick. It's solid value for a player who could go as high as No. 20. Lauer could be the pick at No. 26 if Lux is off the board. What the Orioles do is fairly up in the air, and they could target a prep player as well. This is another value pick, as Reynolds could go much earlier than this. He'll likely be a first round pick. Mendoza has talent, but is a firm commit to Florida State. Someone will take a risk and take him, and the Nationals, could be an option. The Rangers like toolsy players, and that's exactly what Trammell is. This is the right range for Benson. The Mets already landed one hitter, but taking a prep hitter with their compensatory pick makes sense. A pitcher also makes sense. Sheffield could be in play for the Dodgers' first pick and he's the obvious selection if he lasts this long. Sedlock could go a full 10 picks earlier than this, making it solid value. Of course, if the Cardinals do take Manning, they'll need to save money with this pick. Dunning is riser and should be Top 40 pick, much like Sedlock. He shouldn't be too expensive, making for a logical Cardinals selection. He can help early in his career as a reliever.